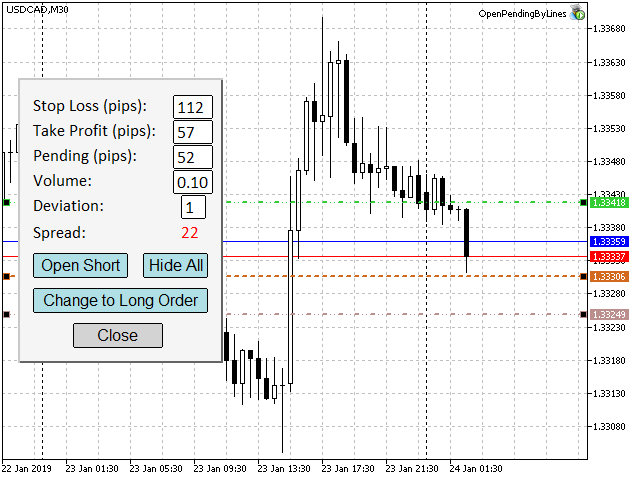 The simplest method to open a LONG or SHORT pending order visually. You can simply select your desired profit and risk pips, just by sliding Takeprofit and Stoploss lines, instead of entering the price value directly, and then open the position by a click. OpenPendingByLines has a panel, consists of input parameter text boxes and three sliding lines. 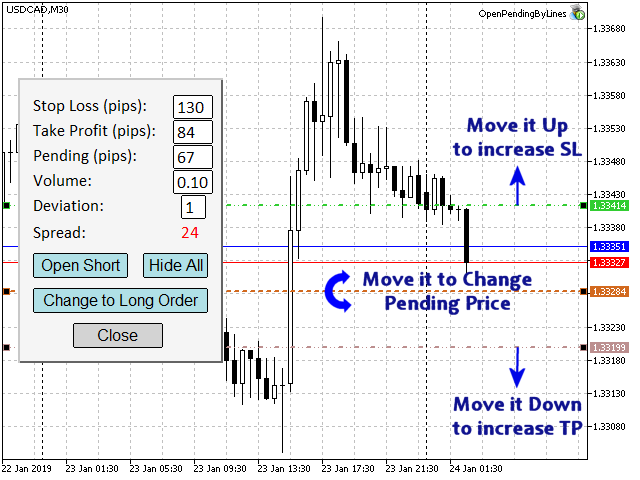 TP, SL, Pending, Volume and Deviation values can be entered in text boxes directly. Sliding lines is another way to change Pending, TP and SL values, and is an effective way to select these values. By each change of lines, their distances to Ask (for Pending line) or Pending line appear in Pending, TP and SL text boxes in PIP unit. Open Long or Open Short button, open an pending order immediately. So control your desired values before click it. Change to Short Order or Change to Long Order button change Open Long or Short button to other state. In Long position, Pending is above Ask line. By clicking on the Change to Short Order button, TP and SL will be replaced by each other. Now the Pending is bellow the Ask line. Hide All button uses to hide all objects, when you open a new position and want to see the price changes without any other lines in screen. The Show All button uses then to show the panel and lines again. At first, you must measure the height of your order (candle high and low), and then create one. 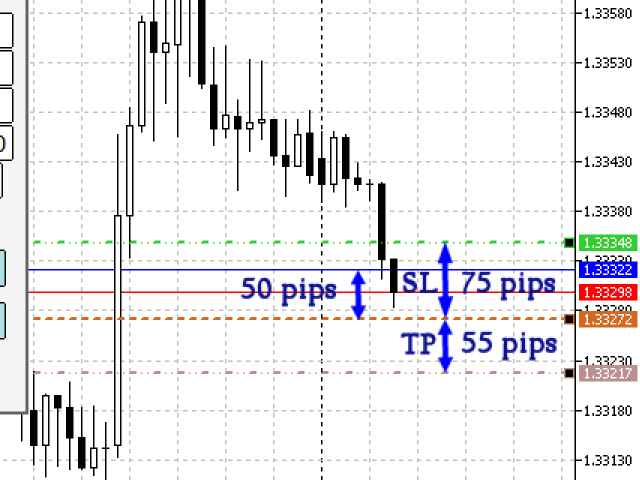 By sliding lines, without any number, we can select the best and confident position for TP or SL. For example, as seen in figures, SL must be bellow the LOW point of a candle in LONG positions, or above HIGH point in SHORT positions. 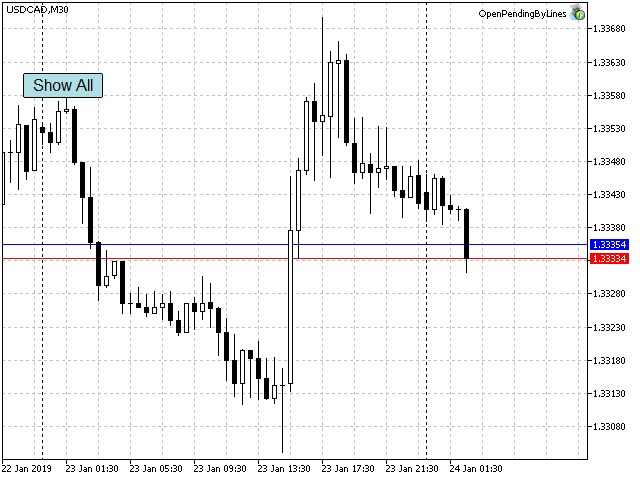 It assures us when reversal move of price happens, the probability to cross over these points is low. OpenPendingByLines is a good tool to scalping in low timeframes and the best for estimating proper value of risk in SL or gain in TP at long timeframes. There is just fiveinput parameters; Three parameters for lines color and one to select first order type. You can change order type anytime by click on Change to Short (Long) Order button. Magic number is another parameter which you can use it for multiple orders.